1 Blog, 1 Tree – how it works! 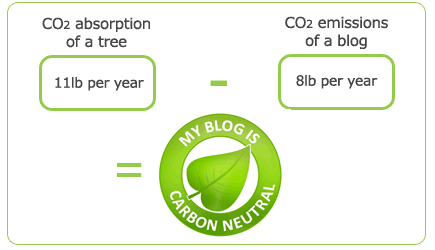 How does a tree neutralise your blog’s carbon footprint? How much carbon dioxide does your blog create? According to a study by Alexander Wissner-Gross, PhD, physicist at Harvard University and environmental activist, an average website causes about 0.02g (0,0008oz.) of carbon dioxide for each visit. Assuming an average blog gets 15,000 visits a month, it has yearly carbon dioxide emissions of 3,6kg (8lb.). This can mainly be tracked back to the immense energy usage from (mainframe) computers, servers, and their cooling systems. Does your blog have more than 15,000 visitors a month? Just e-mail us at CO2-neutral@kaufda.de. We make sure we neutralise your blog too. Unfortunately, no precise answer is possible. The carbon dioxide absorption of a tree can differ a lot. The amount of carbon dioxide that a tree can absorb depends on the type of tree, light exposure, length of the vegetation period, latitude, water balance, and the soil conditions. There are many different calculations for the saving potential of a tree. The assumed values vary between 10 and 30kg (20 and 70lb.) for a tree each year. It is certain however, that in its first two to three years a tree absorbs relatively little carbon dioxide. In the growth phase following this, the absorption rate increases rapidly. During this time, the tree safes a considerable amount of carbon dioxide. The absorption rate decrease again from the age of 18. The United Nations Framework Convention on Climate Change (UNFCCC) assumes a yearly absorption of one tree of approximately 10kg (20lb.) carbon dioxide emissions. “Make it green”, the environmental programme of kaufDA, is using a yearly absorption value of 5kg (11lb.) for its “My blog is carbon neutral” initiative. This is a very conservative calculation, ensuring that the neutralisation of each blog is achieved. Update: If you are from the US you now have the possibility to contribute aswell. Be sure to check out “Green Gestures” from the shopping and weekly ads portal retale.com. Mach's grün hat das Ziel eine Million Bäume zu retten indem eine Million Briefkästen auf das Erhalten von Prospektwerbung verzichten. Mit den Änderungen und denen die wir schon selbst durchgeführt haben, haben wir unsere Angriffsfläche um einiges reduziert.